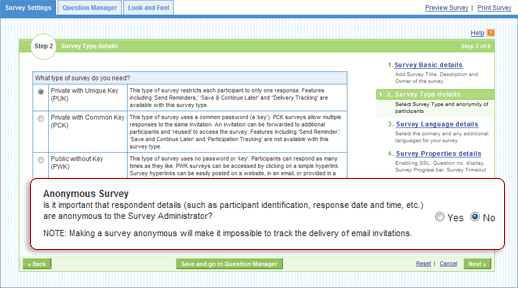 Making surveys anonymous increases the honesty of the responses, thus increasing data quality. People feel more secure in being completely honest when they know that their responses won’t be tied to their identity, IP address, or email address. When the anonymous setting is applied, surveys will state that they are anonymous, to ensure that respondents know they can honestly express their opinions without fear of being viewed negatively by Survey Administrators. The best response are honest ones, and to provide for data assurance, Survey Administrators should make surveys anonymous when applicable.